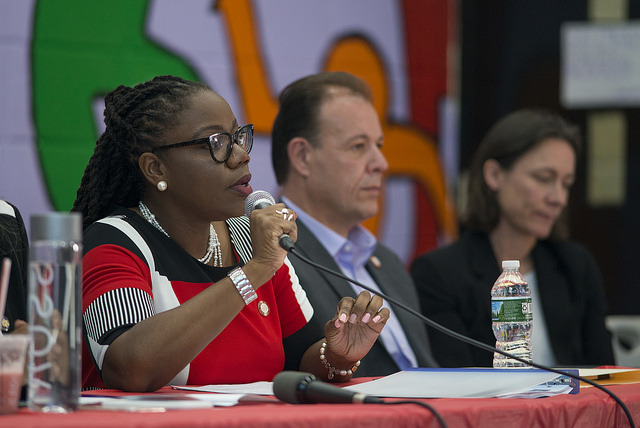 Alicka Ampry-Samuel is the chair of the City Council’s public housing committee and represents parts of central Brooklyn, home to many NYCHA residences. During a recent appearance on the Max & Murphy show on WBAI radio, Ampry-Samuel explained some of her concerns about the latest NYCHA-related developments, said that de Blasio had not reached out to her ahead of announcing that Sanitation Commissioner Kathryn Garcia would be named interim NYCHA chair, and promised a public hearing on the city’s deal with HUD in the coming months. Ampry-Samuel had measured praise for de Blasio’s NYCHA 2.0 plan, which includes fairly aggressive measures to bring in new revenue to address the housing authority’s $30 billion-plus in physical needs, but she joined the chorus of critics who have questioned the mayor’s deal with HUD that includes no new federal money for NYCHA. On January 31, de Blasio announced at a press conference with Department of Housing and Urban Development Secretary Ben Carson a deal that includes the federal government taking more direct oversight of NYCHA in response to years of crisis, criticism, management turmoil, and federal law enforcement inquiry. Opponents have criticized the deal as giving too much power to a federal government that has often been at odds with the de Blasio administration and not supportive enough of public housing. The deal includes no new federal funding but a federal monitor who will be tasked with tracking NYCHA’s actions. 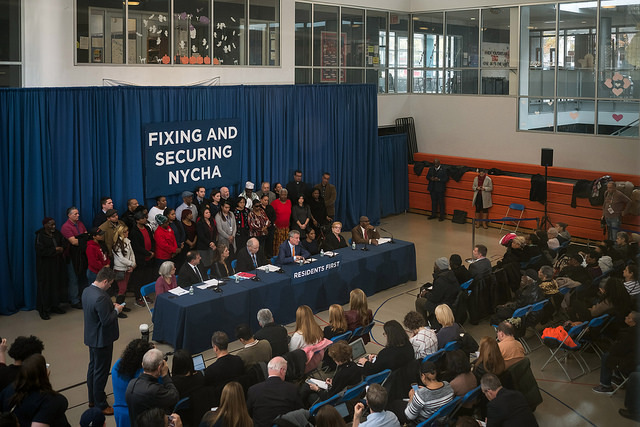 In December, de Blasio announced NYCHA 2.0, a revamped comprehensive plan to reform NYCHA and bring in more than $20 billion in revenue to repair the crumbling and dangerous public housing home to more than 400,000 New Yorkers. Some of the measures de Blasio had either rejected in the past or supported in far more limited fashion, but he said that without large-scale federal help, the city had no other viable options. According to a de Blasio press release, the plan will resolve $24 billion in repairs, including renovations for 175,000 residents. Some of that will depend on new development on underused NYCHA land, such as parking lots, where a mix of market-rate and affordable housing will be erected. Ampry-Samuel appeared to acknowledge the elements of the plan as necessities, despite the fact that many have expressed grave concerns about such “infill” housing. The development process must be community-led, she said, and the money from development must be reinvested in the particular NYCHA projects where the new housing is built. 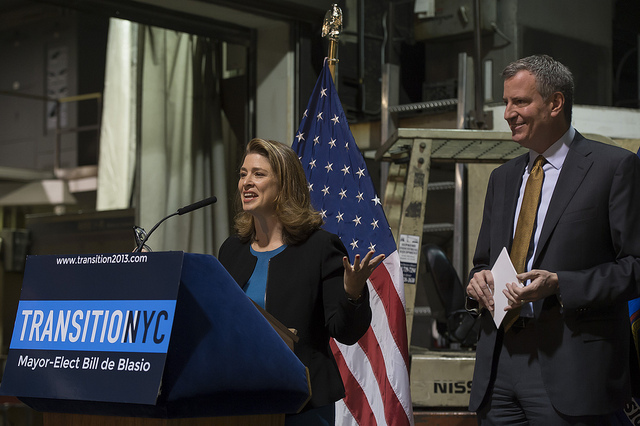 Just last week de Blasio announced his next choice for interim chair of NYCHA: Kathryn Garcia, commissioner of the city’s Department of Sanitation, whom de Blasio had also recently put in charge of lead remediation efforts, which came out of the NYCHA lead paint scandal. Garcia replaces outgoing interim chair Stanley Brezenoff who recently criticized the city’s deal with HUD. A permanent chair, perhaps Garcia, is expected to be named after the federal monitor is in place, given that the monitor will have a say in approving de Blasio’s choice to head the authority. The City Council Committee on Public Housing plans to hold an oversight hearing with Garcia, the administration, and a HUD representative on the deal between HUD and the city and NYCHA in the next several weeks, Ampry-Samuel said. She called for the creation of a chief resident officer as an advisor to the chair of NYCHA. The position, she hopes, could spur a greater relationship between NYCHA and NYCHA residents, though there are also tenant councils. Asked about a time frame for the hearing she promised, Ampry-Samuel was hesitant to provide specifics, given how unsettled things are and how fresh the deal with HUD was, but she said she looked forward to a public discussion of all the recent changes and those to come. Had the Department of Housing and Urban Development (HUD), Congress, and various Presidents funded public housing at a level equivalent to its needs for the past two decades, NYCHA would still have problems, but not at the scale it does today. Nor would a progressive Mayor be wholeheartedly embracing private management of about one-third (62,000) of the city’s precious, low-cost, public housing units. 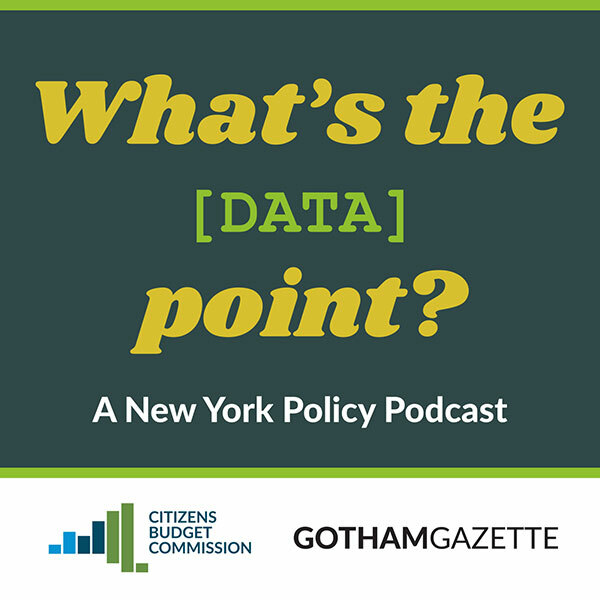 The only way to understand why the Mayor, NYCHA leadership, and many local politicians endorse increasing the use of public-private partnerships to run NYCHA is to step back and view NYCHA’s problems through the wider angle of changing federal policy. From the 1930s to the 1990s, NYCHA lobbied for and won federal subsidies that allowed it to build and manage public housing on a massive scale. Sadly, most other American cities used these same subsidies to create much smaller, lower-quality, worse managed, more isolated, and thus less popular systems. New Yorkers, by contrast, grew accustomed to the idea that a city would have 175,000 decent low-cost apartments thanks to Uncle Sam. NYCHA employees dutifully managed thousands of towers even under very trying conditions. By the 1990s, however, New York stood out like a sore thumb. The federal government, responding to public housing problems nationally (such as those in Chicago), was now paying to knock down towers and complexes, encouraging privatization, and pouring more money into voucher programs (i.e. Section 8) and low-income housing tax credits. The whole federal funding system for public housing was redesigned from the ground up to emphasize private sector leadership in low-cost housing. The towers in cities like Chicago and Baltimore, many of which were only partly occupied by this point, came down at amazing speed, replaced with vouchers and privately-run, mixed-income, medium- or low-rise neighborhoods. Few former public housing tenants were rehoused on former public housing sites; instead, they were mostly scattered into private housing thanks to voucher programs. New York, with full towers, a decent management reputation, tight housing market, and local political commitment to public housing, barely participated in these redevelopment programs. The demise of large, high-rise, elevator buildings (and public housing more generally) in the rest of the United States was, however, terrible news for NYCHA. The loss of a national program and the urban political allies dedicated to expensive and publicly-run urban public housing led to systemic disinvestment. Even “good” federal funding years did not provide anything close to the needed funds for reinvestments and operations in New York, especially given the advancing age of most buildings. The shift in federal housing policy meant the cuts were permanent features of public housing management. NYCHA officials were in denial for years. They thought they could "manage" their way out of the problems created by budget cuts until the federal picture improved -- as they had sometimes in the past. They were wrong. Looking back now we see that the dramatic declines in operating and capital funds led to the loss of thousands of experienced employees, deferred maintenance (i.e. mold, peeling paint, broken boilers), compliance failures, inexperienced hires, and more. NYCHA labor unions also successfully fought policy changes and efficiency measures that would have improved quality of life for residents. When it comes to a massive housing system -- in a very expensive city -- less money inevitably meant lower quality service. The Mayor's emerging plan for NYCHA 2.0 is an overdue acknowledgment that the federal funding landscape has permanently changed. There will never be a day or decade when NYCHA can from federal funds meet its $31.8 billion capital need, or even fully fund its operations. And while the City has made up for some shortfall over the past few years, to the tune of billions of dollars, it isn’t realistic to believe that the City will redirect tens of billions more of its own capital and operating funds (unless the courts force its hand) from other worthy causes. Shifting 62,000 NYCHA apartments to private-sector management, as planned in the initial portion of NYCHA 2.0 that we’ve now seen, through various voucher programs, allows private companies to combine rents, voucher reimbursement, and federal tax credits with the money they can borrow as mortgages, loans, etc. They will apply these funds to renovating tens of thousands of apartments in structurally sound NYCHA buildings. They can shave labor costs by hiring new workers and investing in technology. They can take a harder line on rent collection and resident behavior. NYCHA buildings clean up well under good private managers and new employees, as anyone who has visited the RAD Ocean Bay project can attest. By shifting so many apartments to the private section, moreover, private managers will relieve NYCHA of billions in unfunded capital needs, and of the management of most of its smaller developments, allowing remaining NYCHA staff to focus on the larger projects in its portfolio. The city, of course, will not face a massive bill for renovation. There is an undeniable political payoff as well: future problems at these complexes will no longer be a mayoral liability. Many residents, local politicians, employees, and activists are leery of NYCHA “privatization.” Indeed, the NYCHA 2.0 plan, promised by Mayor de Blasio by the end of the year, needs to build in solid protections for current NYCHA residents, encourage non-profit participation in private management, and spell out the long-term fate of these apartments as residents come and go. Given the dominance of the private sector in federal policy, and the current balance of power in Washington, those who believe in purely public housing -- the old NYCHA -- will have difficulty developing an alternative and equally beneficial plan. The ball is in their court as the NYCHA 2.0 plan develops. Nicholas Dagen Bloom, Ph.D. is a professor at New York Institute of Technology and the author of many books. 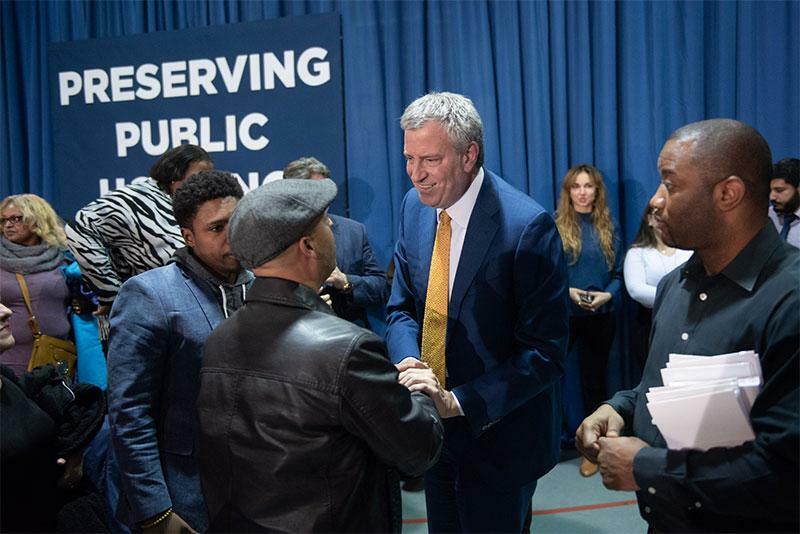 The myriad issues plaguing the New York City Housing Authority came to the fore at a town hall on Wednesday night, with NYCHA residents excoriating public officials and officials scrambling to respond. The town hall, hosted by BRIC TV at its downtown Brooklyn studio, featured an audience mainly consisting of NYCHA residents and a panel of City Council Members Alicka Ampry-Samuel and Ritchie Torres, NYCHA tenant leader Lisa Kenner, New York Daily News reporter Greg Smith, and NYCHA historian Nicholas Dagen Bloom, along with a short pre-recorded interview with city Comptroller Scott Stringer. The event was moderated by BRIC’s Brian Vines. The issues affecting NYCHA, including but not limited to an alleged cover-up relating to lead paint in apartments, approximately $32 billion in unmet capital needs, and a lack of transparency in management have hung low over the de Blasio administration for the past year. 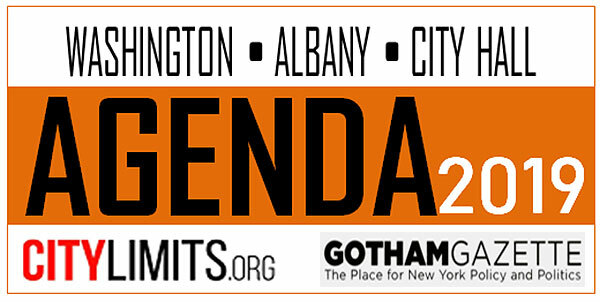 The city, beginning in the Bloomberg Administration, was revealed to have falsified documents submitted to the federal government relating to lead paint inspections in apartments, setting off an additionally intensified period of controversy beyond what was already been a mountain of challenges and persistent struggles for the authority to provide adequate housing and find the revenue needed to upgrade its deteriorating housing stock, which includes roughly 180,000 units across the city, home to about 400,000 New Yorkers. The Daily News reported in June that the de Blasio administration had used a blood-lead level benchmark significantly higher than the federal standard, resulting in only 19 children living in NYCHA being identified as having elevated lead levels; by the federal standards, 820 children in NYCHA had elevated levels, a number revised to over 1,100 in August. And last winter, hundreds of thousands of NYCHA residents were left without working heat and hot water because of defective boilers in critical need of repair. A federal consent decree, which has yet to be formalized by a judge, would have New York City spend $2 billion on critical repairs and appoint a federal monitor to oversee the ailing Housing Authority. The judge has yet to name a monitor. In practice, the deadline has been extended twice by the United States Attorney for the Southern District of New York, first from July 11 to September 12, and then from September 12 to whatever date the judge formalizes the consent decree. 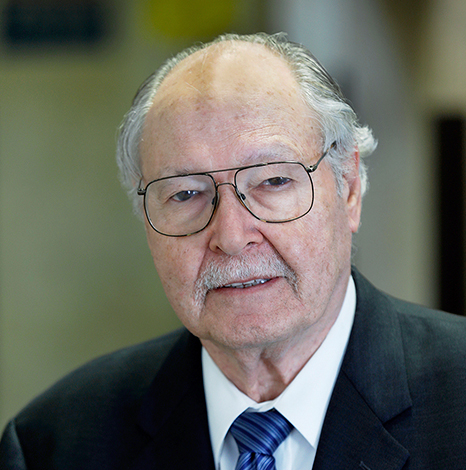 When tenants testified in court about NYCHA conditions on September 26, the judge, William Pauley, expressed shock at their stories, and has been hesitant to approve the consent decree without changes. Several speakers had been personally affected by the lead paint scandal, with their children facing the possibility of lifelong repercussions as a result of the lead-infested apartments they spent their formative years in. “Y’all exposed them to lead dust and continue to disrespect me and violate me,” said Lynone Faison, a resident of the Ingersoll Houses in Fort Greene whose child was exposed to lead. Faison said she would prefer living on the street to living in her apartment, but was refraining from doing so because she was worried that ACS would take her children. Another woman, a former resident of the Al Smith Houses on the Lower East Side, detailed how her son had been exposed to lead during her pregnancy; she left NYCHA after giving birth, when the woman she and her husband had been caring for passed away and the city evicted them. She also referenced the stark inequality that has been spotlighted in the development’s vicinity. Ampry-Samuel is the current chair of the Public Housing Committee, and Torres is a former chair of that committee and the current chair of the Oversight Committee, which has looked into NYCHA and helped reveal some of the recent issues that have come to light. Both grew up in NYCHA housing, Ampry-Samuel in Brownsville and Torres in Throggs Neck, and relayed their experiences in public housing frequently throughout the hearing. Infill is the controversial process by which the city is allowing private development on NYCHA land to create new housing, some of it affordable, as well as new revenue for NYCHA. Despite their ties to NYCHA and efforts to provide oversight, the politicians in the room were heavily criticized as detached from conditions on the ground, taking home a $150,000 salary, and being funded by real estate interests. Questioners repeatedly expressed derision at the panelists not answering their questions, even those on the panel who are not politicians. The frustration of the NYCHA residents characterized the mood of the event. “How do they get to go forward with RAD or infill when they’re under a federal investigation,” asked Karen Blondell, a resident of Red Hook Houses since 1982. RAD refers to Rental Assistance Demonstration, an Obama-era program that privatizes building management and changes ownership of the property to a public-private partnership, with funding coming from Section 8 vouchers rather than Section 9 public housing subsidies. One complex, the Ocean Bay Apartments in Rockaway, has undergone full RAD conversion. Initial results have appeared somewhat promising in the city, and elected officials have praised the use of the program, though many residents are worried that the program is de facto privatization of public housing. Ampry-Samuel has been supportive of the RAD program in the past and has sided with the de Blasio administration on its expansion. However, she agreed with Blondell that critical repairs must be made the top priority of the authority. Blondell replied that her apartment underwent a long-awaited lead inspection last week, but the “industrial hygienist” who showed up for the inspection was armed only with a flashlight. “Come on now, come on, I could do better testing by sending away for a kit to the EPA,” she said. In response, Torres signaled his critiques of the consent decree. “There’s no evidence that more monitoring is going to improve public housing,” Torres said. “We’ve had a monitor for mold for five years, and we’re no closer to remediating mold in public housing.” A vocal critic of the mayor and his housing policies in particular, Torres said at the town hall that affordable housing under the mayor’s plans are not actually affordable for the people they’re intended for -- some have called for incorporating NYCHA into the larger city affordable housing plan so that it gets more attention and is more clearly approached as part of a valuable stock of rent-regulated apartments, or for at least more closely aligning affordable housing and NYCHA plans. There have been ample calls for prosecutions of NYCHA officials involved in the lead scandal. Though NYCHA is under federal investigation and its offices have been raided by authorities, prosecutors have not announced any charges. “When we as residents had to deal with zero tolerance from the Clinton administration to present time, how is it okay for NYCHA to have falsified, fraudulently reported about lead, mold, and everything else, and no one’s being criminally charged,” Blondel asked. Smith noted in response that an active criminal investigation into NYCHA is currently taking place to look into fraudulent lead paint filings. “That tenant participation activity money that was meant to be spent for us in these developments to create programs and things for our families and so forth, that’s HUD money, we don’t even know what’s happening with it. We was promised there was gonna be a hearing, that ain’t happened yet,” she said. Kenner, the tenant leader, spoke in defense of tenants associations. The woman from Washington Houses vociferously criticized the city government and the Council members, and advocated for direct action against the city as a means of securing tenants’ rights. “The only way we’re gonna get justice is by shutting 250 Broadway down,” she said in reference to where main NYCHA and City Council offices are located. Smith made a similar call later in the program, saying that the hundreds of thousands of NYCHA residents should vote as a bloc. 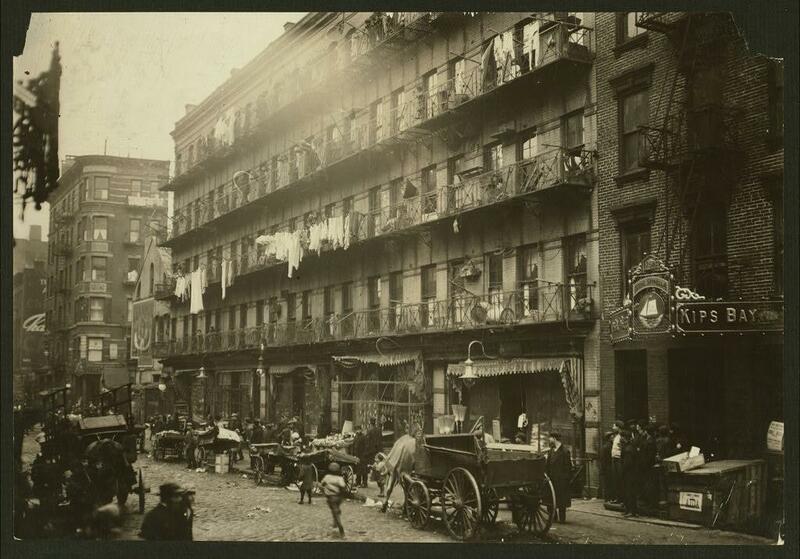 “If NYCHA residents, there are 400,000 people who live in New York City housing. So if you have an organized effort to vote with one voice, you will have a voice that people will actually listen to,” Smith said. This message received a mixed response in the room, and Vines reiterated a point made earlier about how NYCHA residents did not have monolithic thoughts on all issues. To that question, Torres responded in the affirmative and endorsed Smith’s proposal. 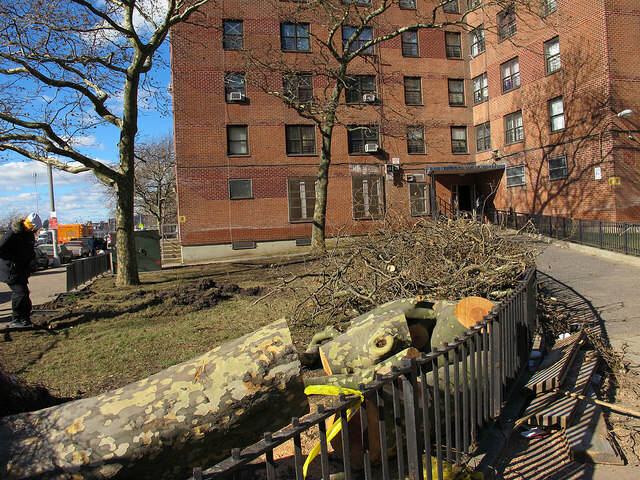 NYCHA needs about $32 billion in upgrades over five years to enter a state of good repair. The housing authority is in nothing short of a crisis, both in terms of its overall needs, which have been building for decades, and the recent lead paint scandal, which has led to a federal consent decree with the city and incoming federal monitor. Just after the new NYCHA needs assessment and its $32 billion price tag was recently released, Citizens Budget Commission released its own report about NYCHA's dire situation and where the authority must go to have a chance to survive. 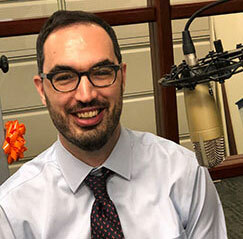 The report's author, Sean Campion, joined the podcast to discuss CBC's findings and recommendations.